In a small shack on Calle Calzada, there are two pairs of pointe shoes for sale. A few blocks over, in a small pink house with a dance store in front, there are none. Both owners have a handful of ballet shoes. But for the hundreds of dancers in Cuba, that is far from enough. The owners of these stores have no way to determine when they will get more inventory. Cuba without dance is like a ballerina without shoes. But for many dancers in Cuba, dancing without proper shoes is reality. Neither pointe nor ballet shoes, crucial for practice and performance, are imported for sale on the island. From salsa to reggaeton to classical ballet, Cubans take pride in their dancers. The city of Havana has more than a dozen ballet schools including The Cuban National Ballet, Acosta Danza, DanzAbierta and the ProDanza Center for the Promotion of Dance. The ProDanza Center houses the Laura Alonso Ballet Company in the Marianao borough of Havana. Arasay Toledo Diaz, 19, is a dancer with the company and relies on donated shoes. 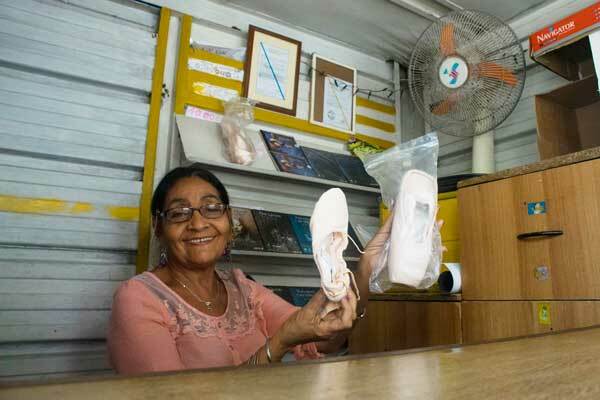 Mari Lu, a shoe vendor, holds up pointe shoes and ballet shoes she has for sale. Her small shack also offers ballet DVDS, posters, and a handful of T-shirts for sale. Proper pointe shoes are critical for any aspiring ballerina because they allow the dancer to go, as the name suggests, on the “point” of their toes. This skill requires years of conditioning and special strength training. It also requires a strong, properly fitted shoe. The box of the shoe, or the part the ballerina balances on, is typically made of densely packed cardboard, fabric and glue. Cuba’s heat and humidity, coupled with ProDanza’s outdoor practice facility, can cause the shoes to break down quickly. About 250 miles north, dancers at Miami City Ballet go through two to four pairs a week during show season. But due to their unavailability in Cuba, many of the ProDanza dancers use the same pair for up to a year. Laura Alonso, daughter of Cuba’s first prima ballerina Alicia Alonso, is the director and founder of the Laura Alonso Ballet Company and ProDanza. She’s amazed her students are able to use their shoes for so long. Alonso is in a unique situation. Despite working and living in Cuba, Alonso was born in New York, which gives her American citizenship and the rare opportunity to bring dance shoes to Cuba. Her citizenship also allows her to teach master classes around the world for both professional pay and dance shoes, the latter of which she distributes to her more than 450 students. Collecting myriad sizes of two different types of shoes for that many dancers is like a second job for Alonso. But she says being able to help her students, both those abroad and those in Cuba, connect to one another’s culture and the universal love of dance, makes it worth it. Danielle Chanzes interpreted for this story. 30 seconds of Dracula from UF Outside In on Vimeo. A dancer practices barefoot on an outdoor stage at the ProDanza center.